Details: PuracleenRX is a brand of eco-friendly cleaning products. Ingredients in some of the products have been proven to kill h1n1(formerly swine flu). This trifold was to be used in stores that carry PuracleenRX products. Objectives: To design a co-branded trifold to be used at sales conferences across the country. Details: SECON is a drug testing company headquartered in Lafayette, Louisiana. The Facet Group is a background screening organization that is also stationed in Lafayette. The main point of the trifold was to promote the two companies unique joint-services that offers businesses’ background and drug screening in one place. 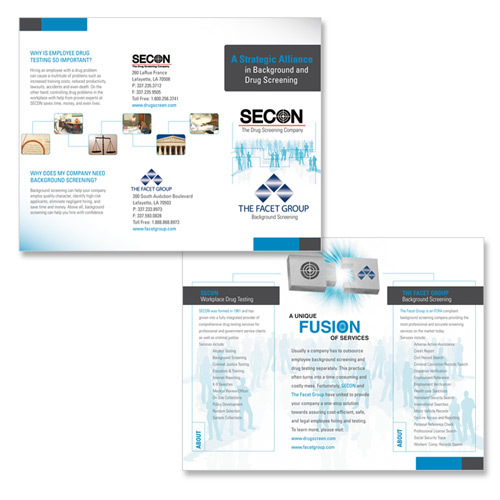 The theme of the trifold was a fusion of services. The artwork and the visual hierarchy of the layout was constructed to stress this point. Objectives: To build graphics and layout for keycard used at the National Smith and Nephew Orthopedic Conference in Miami during Fall 07. Details: Smith & Nephew is a worldwide medical supply company. Their Orthopedics’ division is headquartered in Memphis, Tennessee. My objective was to illustrate the predetermined headline “Your access to new trauma solutions”, while adhering to Smith & Nephew’s very strict branding guidelines. Objectives: To create an identity for a rock band. Tasks included making a logo, t-shirt, and poster for the band. 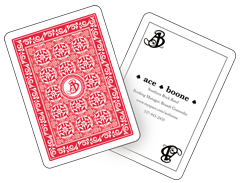 Details: The business card’s were designed to look like playing cards. A multitude of patterns were used as inspiration. Also, the cards were constructed as the exact size of playing cards to look more realistic. 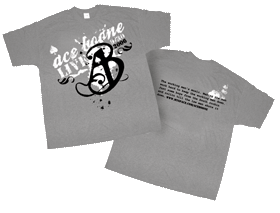 The t-shirt’s style was influenced by contemporary t-shirt fashion. Research included investigating silk-screening methods used at popular fashion destinations.